It is International Stress Awareness Week so today, LID Publishing brings you an extract on how happiness and wellbeing is a vital economic issue for businesses and the economy. “Happiness is a state of being. Studied for decades, the question “What makes us happy?” has been posed all around the world, over time, and in different ways. Happiness is an important emotion and has a role in the survival of the species. Feeling good is an overall motivation state that keeps us alive. The avoidance of loss and pain and the search for good feelings is the mechanism that has preserved and multiplied the human race. The impact of happiness has been demonstrated in different studies to improve health, life expectancy, recovery from setbacks and much more. Dr. Ross McDonald describes most people as wanting love, acceptance and a sense of positive purpose. And given the fundamental nature of these needs, people will give huge attention to anything that suggests it will satisfy them. Happiness consists of positive emotion (hedonic pleasure), and assessments of flourishing meaning and purpose (eudaimonic well-being) – both are important in evaluations of life satisfaction. Happiness is not only an individual quest, but is something organizations are keen to enhance among employees because there are organizational benefits to a positive, engaged, and energized workforce. Well-being is part of the measure of human capital, which is finding its way ito the annual reports of listed companies. There is little doubt that the management of health and wellbeing in the workplace reduces healthcare expenditure and yields a significant return on investment. If we look at happiness and unhappiness as two ends of a health dimension – the cost savings alone of reducing unhappiness (both in direct financial terms and downtime resulting from unhealthy employees) should raise the priority of the “happiness” agenda in the workplace. At the other end of the dimension, optimal health is a factor in optimal productivity; engaged employees are associated with innovation, described as moving the organization forward and putting their discretionary effort into driving growth and performance. And the quest doesn’t stop at organizations. Nations too are keen to enhance the over “happiness” of their populations. With an aging population and the growing health challenges across the age spectrum combined with the benefits that happiness can bring, happiness is a vital economic issue. From our work exploring employee engagement across organizations, despite great satisfaction when a much hoped-for change has taken place, the initial euphoria soon reduces to create a new baseline. Fostering wellbeing and happiness among employees can be rather paradoxical for organizations. People come to work in order to get paid, and it is important for organizations to get comparative rates fo pay right. Employees will also focus on how much they are paid in comparison to others, and whether those rates are fair. It’s part of being human – it is avoidable. At the same time, rates of pay alone do not determine happiness and being overly focused on pay at the expense of all other aspects of work is not likely to lead to an engaged workforce. From the brief overview of what makes us happy, it’s easy to se that there are many other ways to enable happiness and wellbeing in organizations. The 31 Practices approach is closely aligned with many of the factors listed above that promote greater happiness and wellbeing: employees choose how they interpret the Practice of the day, giving them control and choice; we have found that the clear direction provided by the vision, values, and Practices establishes a stronger sense of belonging, purpose and positive relationships; when linked to a recognition programme, stories are captured and publicized, creating a feeling of competence and personal growth; finally, 31 Practices is a very practical approach and a journey where it is understood that sometimes things will not go as well as they might have done, providing an environment of self-acceptance. It’s easy to view happiness as a right, as an inherently “human” condition. However, there is no reason why we should be happy – biologically. Instead, it’s more helpful to see attaining happiness as a skill. In this way, practicing “being happy” makes more sense and makes happiness actually more attainable. You can make a substantial difference to how you feel by developing happiness practices in your life. Appreciate what you have and appreciate others. We all have many choices in life, one of which is whether to focus on all the things we don’t have (of which there might be many) or to focus on all the things we do have (of which there are likely to be many). There’s no doubt that gratitude and appreciation will significantly increase your chances of experiencing happiness. Think about five things each day that you are thankful for and let others know. Perform random acts of kindness. A random act of kindness is a selfless act to help or cheer others. Others won’t expect you to perform these kindness acts, but will definitely appreciate your efforts. Cultivate optimism. Practice optimistic thinking when faced with a problem. That is, not overly positive thinking, but optimistic thinking. If you do not choose to engage in these practices, and we recommend that you do, notice how they impact your felt sense of happiness and your energy. 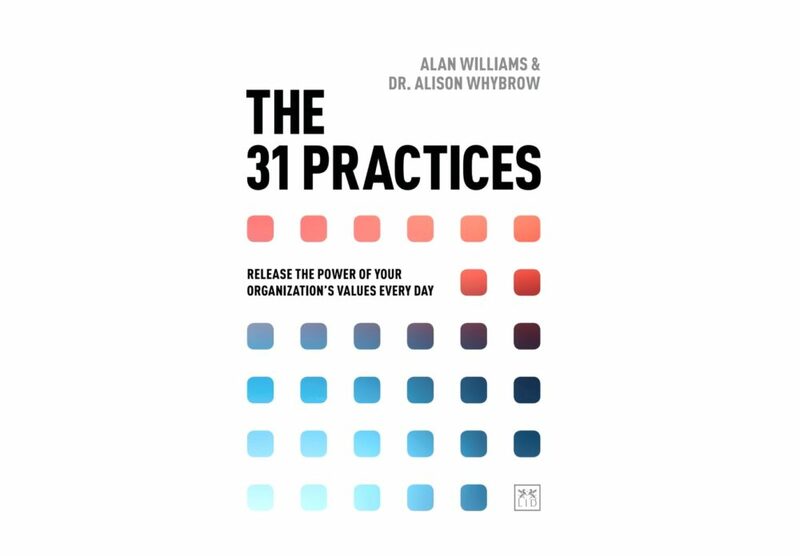 The 31 Practices is available to buy here.